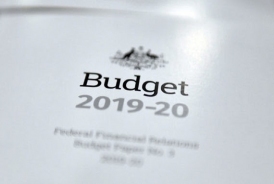 Treasurer Frydenberg announced the 2019 Federal Budget last night, promising a surplus and tax relief in the next financial year, but what does the Budget do to address the many barriers faced by Australia’s First Nations Peoples? ANTaR National Director Paul Wright provides his analysis. Budgets are always an opportunity to put our money where their (the Government’s) mouth is. But, where your treasure is, there your heart is also… what do I mean? If Government’s commitment to adequately budget for the health and wellbeing of Australia’s First Peoples matched the promises made over the years, I am confident we would have been a lot nearer to closing the gap in health outcomes and life expectancy by now. Australia remains one of the richest nations on earth, and while there are undeniably difficult global economic headwinds challenging Australia’s bottom line, we are talking about shifting degrees of world leading wealth and prosperity. With that in mind, how is it that the government can find money for a surplus and large tax cuts but can’t find money for a major, long-term boost to funding the Government’s own Closing the Gap Strategy? Where are the major nation-wide investments in Justice Reinvestment programs (invest in communities instead of prisons), or funding that aims to address the impacts of intergenerational trauma that lead to horrific rates of youth suicide? Where is the funding for Aboriginal peak organisations and community controlled services? I recognise that this is an Election budget (99 per cent of this budget won’t even be legislated before the Election). Maybe it is that the three per cent of the population that is made up of Aboriginal and Torres Strait Islander citizens isn’t a big enough voting block to spend much time worrying about. Getting this right should be a critical, national priority for all of us. If you haven’t seen it, check out ABC iView for Miranda Tapsell’s powerful monologue recently on the ABC’s Get Krack!n – we should all be angry at the injustice. Anyway, back to the Budget. In a Budget that is worth nearly half a trillion dollars, there are some meagre new measures to address the issues we have been advocating on for years. I suggest checking out the media releases of Nigel Scullion, Indigenous Affairs Minister and Ken Wyatt, Minister for Indigenous Health. What’s in it that could be good? $62.4 million over four years from 2019-20 to expand second chance learning in Language, Literacy, Numeracy and Digital Skills to upskill at-risk workers, and to trial four Indigenous delivery pilot programs providing tailored services in remote communities. $10 million over three years from 2019-20 to the Lowitja Institute, Australia’s National Institute for Aboriginal and Torres Strait Islander Health Research. (This is great, but there are many other Aboriginal Peak organisations that are desperate for funding). $160 million for Indigenous Health Futures (Already announced in February). $276.5 million over five years from 2018-19 to support Indigenous students to undertake and complete study to help close the gap in education outcomes between Indigenous and non-Indigenous students. (Already announced in February). $200 million over four years from 2019-20 to fund additional scholarship placements and mentoring support for Indigenous students. (Already announced in February). $36.4 million over five years from 2018-19 to extend Family Tax Benefit eligibility to the families of ABSTUDY (secondary) student recipients who are aged 16 years and over, and are required to live away from home to attend school. $35 million to address the specific needs of Aboriginal and Torres Strait Islander people affected by violence, including providing greater support for Indigenous women and children in remote areas and supporting practical intervention programs to work with Indigenous young people and adults at risk of experiencing or committing family violence. Extending cashless debit cards… with mixed reporting at best, the paternalism of this program is shameful and there is no justification for extension. Plenty. Major investments in housing, health and justice reinvestment are missing and are a matter of urgency. The one caveat is that the Government, along with their State and Territory government counterparts have just entered into a formal partnership with a Coalition of Aboriginal Peak organisations to negotiate the new Closing the Gap Strategy. We can (generously) give the Government the benefit of the doubt and assume that the policy and resource vacuum will be addressed through the process of this formal partnership. However, it would have been better to see some good faith investments from the Federal government in this Budget in the interim… but for now we wait. Now that we have seen the Budget, we expect that later this week the Prime Minister will call the Election for mid-May. We will have 5 weeks to assess the promises of the Government, the Opposition, and the other major parties regarding Aboriginal and Torres Strait Islander affairs. ANTaR will be releasing a Federal Election Scorecard in the last couple of weeks before Election Day to help collate and assess the policies and party platforms as they relate to Australia’s First Peoples. Please keep your eye out for this and share widely! We can all make a difference. It is more than just the three per cent that make up the Aboriginal and Torres Strait Islander nations and communities in Australia. It is the many thousands of ANTaR supporters, our friends and family, with our efforts combined we can have a significant influence on the outcome of the Election. We need to send a message that the health, wellbeing and liberty of the continent’s First Nations Peoples is a priority issue for our vote.